In light of the recent escalation of violence in the Kivus, the emergence of M23 rebellion, and the ongoing negotiations in Kampala, we thought it important to place the latest cycle of conflict in the Democratic Republic of the Congo in its proper historical context. Herbert F. Weiss, emeritus professor of political science at the City University of New York and senior policy scholar at the Woodrow Wilson International Center for Scholars, offers his reflections in a reposting of African Futures’ first contribution, written in February 2012. — eds. The Democratic Republic of the Congo (DRC) has an image problem. Sometimes it is viewed as the most violent of violent societies. At other times its population is viewed as passive and fatalistic. This essay attempts to shed some light on this paradox. Its underlying thesis is that the Congolese people have shown a great interest in the politics of their country. When given a chance they have used the right to vote in sophisticated ways, and when they felt betrayed have supported dynamic protest movements—sometimes violent, sometimes non-violent. However, there have been long and frequent periods when external interventions have rendered protest seemingly hopeless. During such periods the Congolese have often appeared to be apolitical and passive. Yet there have also been periods where Congolese have mobilized to oppose and even overcome such external intervention, particularly in the East. Ultimately, we must ask ourselves whether the growing resistance to the Kinshasa regime in the wake of the recent national elections will manifest itself in a new (and possibly violent) protest movement, or whether repression by the regime will result in another period of seeming passivity. The struggle for independence started quite late in the Congo. In January 1959, there was a major riot in Leopoldville (today Kinshasa) for which the leaders of the ABAKO (the ethnically-based political party of the Bakongo people) were blamed and jailed. This led to an extraordinarily fast and successful mobilization of the Bakongo and a complete boycott of government services in the Lower Congo region. ABAKO participated in an alliance with other political parties that were committed to a demand for immediate independence and a federal state structure. Some leaders were sent abroad to explore getting aid for the anticipated (possibly violent) struggle and to explore the establishment of a provisional government in exile. Belgium, fearing an Algeria-like violent struggle, called a Belgo-Congolese conference in January 1960, at which (to everyone’s surprise) they agreed to full independence as of June 30, 1960. In sum, Belgium capitulated, and as a result, no protracted struggle occurred—the potential for a violent anti-colonial uprising vanished. However, the rapid and effective mobilization of the ABAKO demonstrated a clear potential for well-organized resistance to the colonial regime, prepared to use violent means if necessary. National elections were held in May 1960 in anticipation of independence. Although most Congolese had never had the opportunity to vote before, and despite an extraordinarily complex electoral system, the Congolese public participated massively and their electoral behavior demonstrated a sophisticated use of the ballot to further their perceived self-interest. In the end, the more radical nationalist parties were victorious, with Patrice Lumumba at their head. Within days of the achievement of independence, the colonial army mutinied, Belgian civil servants fled, Katanga and “South Kasai” seceded, and a UN peacekeeping mission (ONUC) arrived in the country. For a variety of mistaken reasons, Lumumba was soon defined by the West as a Communist agent. This resulted in U.S. support for a quasi-military coup against Lumumba in September 1960, the subsequent exclusion of Lumumbists from positions of power, considerable Western (though not US) support for the Katanga secession, and the exile of many Lumumbist leaders. By mid-1963, the return of some Lumumbists and the sharply declining purchasing power of ordinary Congolese sparked the Congo Rebellions. The independence struggle had proven the propensity of the Congolese to support mass protest with the potential for the use of violence. This struggle had also manifested the more radical inclinations of the rural population when compared to elites or urbanites. Immediately after independence, with a sharply declining economy, deep disappointment in the expected material benefits from the attainment of independence, and the exclusion of some of the most popular leaders, the Congolese were available for protest. Revolutionary protest began in the Kwilu region in mid-1963 and then spread rapidly to the Northeast. Left to their own resources and power, the revolutionary forces were destined to overwhelm the government. However, Cold War considerations dominated the international stage, and the West, especially the United States, committed a variety of forces and significant financial resources to defeating the revolution. No satisfactory assessment of casualties is available, but some experts have estimated that over one million Congolese lost their lives during the repression. Both Congolese elites and ordinary citizens saw a lesson in the defeat of the Rebellions: There was no point in rising up against a government supported militarily by the West. This lesson was underlined in 1977 and 1978, when former Katanga secessionist soldiers who had taken refuge in Angola and had been radicalized by its MPLA government, invaded the Congo. Once again, they were initially quite successful and popular, but were met with foreign forces (including the French Foreign Legion and Belgian Paratroopers) supporting the Mobutu government in Kinshasa, and were defeated. The result was the fatalism and even passivity that some observers have noted in the Congolese people, which helped Joseph Mobutu stay in power for over 30 years. However, Mobutu was also able to mobilize mass support—not as protest movements, but to support his regime. In the later years of his rule, both he and his party lost legitimacy in the eyes of the Congolese, but in the early years, the regime was popular. These were years of prosperity, unity, peace, and nationalistic pride after years of war. Even before the Rwanda genocide in 1994, the East had seen more violence and inter-ethnic conflicts than the rest of the Congo. However, the displacement of around one million defeated Hutu from Rwanda into the DRC upset the political and ethnic balance of power in the Kivus, as former Rwandan army units used their refugee camps as bases from which to attack Rwanda. 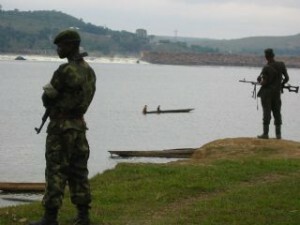 In 1996, Rwanda and Uganda (soon joined by Angola) attacked the Congo in order to eliminate the insurgency camps established in the Congo by exiles from all three of these states. As a smokescreen for their invasion, Uganda and Rwanda helped organize a Congolese revolutionary movement, the ADFL, soon to be led by Laurent Kabila. With the Congolese army largely ineffective, the combined forces of Uganda, Rwanda, Angola, and the ADFL were able to conquer the entire Congo in a little over six months and send Mobutu into exile. In fact, it is unclear how much actual fighting was done by the Congolese themselves. Certainly, thousands of Congolese men and women were recruited by the ADFL, and some of Mobutu’s army units defected and supported the “invasion/revolution.” The most important mobilization occurred among very young men and children from eastern Congo, known as the “kadogos,” who were given a great deal of power after Kabila became president. However, according to most reports they did little fighting, using their status as “veterans” to gain prestige with civilian populations after territory was conquered, although more research on this question is necessary. However, soon after the First Congo War began, a genuine mobilization occurred in eastern Congo by members of the so-called autochtone ethnic groups who deeply resented the presence and dominance of foreign forces (particularly from Rwanda and Uganda). These foreign forces were also allied with the much-maligned and hated Congolese Tutsi, who were viewed as foreigners. This mobilization formed the “Mai Mai” groups—usually, but not always, ethnically homogeneous—and they employed violence against the Rwandan army and their Congolese allies, the RCD-Goma. Initially, the new Kabila government was quite popular, but several factors soon sharply reduced his popularity. Kabila ignored civil society and the substantial non-violent opposition to Mobutu that had fought Mobutu for years, refusing to share power, and he was visibly surrounded by Rwandan Tutsi officers and politicians. He used the Kadogos to control the population, and they abused that power repeatedly. He also attempted to impose something akin to a cultural revolution, with neighborhood committees empowered to control the citizenry. In the summer of 1998, Kabila ordered Rwandan forces to leave the Congo. They left western Congo (particularly Kinshasa), but re-invaded in the East, where they struck an alliance with local Congolese army units. This resulted in a full-fledged war, with Kabila supported militarily by Angola, Zimbabwe, Namibia, and Chad, and resulted in the division of the country into two large zones of approximately equal size—the Kinshasa-controlled, and the “rebel-controlled” areas. There were major differences between the two areas. The Kinshasa-controlled area remained “united,” even though the leadership was unpopular. Meanwhile, the rebel-controlled area subdivided several times, and was subject to Rwandan and Ugandan spheres of influence and/or military occupation. In the rebel-controlled areas, substantial armed protest movements developed. These were the Congolese Mai Mai groups that resisted the rebel administrations. The Mai Mai movements also allied themselves to Rwandan and Burundian Hutu insurgency groups with bases in the Congo, with military, financial, and political support by the Kinshasa authorities. In many ways the Mai Mai resistance can be compared to the 1960s Congo Rebellions—rural-based groups determined to eject foreign forces and influences from their land. And although the territory in which they operated (the two Kivus) was occupied by modern armies, and although initially the Mai Mai had only crude weapons, they managed to dominate the countryside, although they never captured towns or cities. The struggle between the Mai Mai and the RCD-Goma/Rwandan army caused by far the greatest number of casualties of all the conflicts in the Congo since 1994. Initially, they protested the alliance between Laurent Kabila and Rwanda. When that alliance changed into complete animosity (i.e. the Second Congo War), they fought the RCD-Goma, and continued to do so even after the signing of the Lusaka Ceasefire Agreement in 1999. After the Lusaka Ceasefire Agreement, the Second Congo War came to a virtual standstill. On the other hand, war continued in eastern Congo, with an intensity that had not been seen before, and civilian casualties that passed all previous records. In sum, populations in eastern Congo no longer considered foreign power—once represented by the West, and now by the armies of Uganda and Rwanda—to be an insurmountable obstacle to protest or to the use of arms. The previous sense of “hopelessness” had been forgotten, and it was possible to mobilize for armed struggle in eastern Congo. Interestingly, the rebel movements were never able to inspire a similar resistance in Kinshasa-controlled areas, despite the fact—as shown in the 2006 elections—that the Kinshasa authorities were quite unpopular in the areas that they controlled. Eventually after the Lusaka Ceasefire Agreement, and after many attempts, the major Congolese players came to an agreement in Pretoria in 2002 that promised to reunite the Congo, establish a transitional government, draft a new constitution, and organize elections to produce a legitimate government. In 2003, these goals were put into motion with the reunification of the country and the establishment of the Transitional Government, including all major opponents during the conflict between 1998 and 2003. Part of this agreement involved merging all the different armies that had fought each other, including several Mai Mai groups. Despite the problems that this merger posed, the process did not result in any major violent confrontations—with the continuing exception of eastern Congo. The different rebel administrations were formally dissolved, but the personnel were partly integrated into the now national government. Apart from continuing violence in eastern Congo, this region changed in several important ways. The alliance between Mai Mai groups and the Rwandan Hutu insurgency (now known as the FDLR) collapsed, and the FDLR’s position became more isolated under pressure by the new Congolese army (the FARDC). The CNDP, a Tutsi-led insurgency against the Kinshasa government with General Nkunda at its head, managed to fend off several FARDC campaigns and almost captured the North Kivu provincial capital of Goma. With Rwandan help, Nkunda was neutralized, but his army was integrated into the FARDC, helping Kinshasa-supported Tutsi elements to become virtually militarily dominant in the Kivus. These dramatic changes in the balance of power in eastern Congo are largely the result of a rapprochement—largely unpopular among the Congolese public—between the DRC and Rwanda. In 2007, Kikwit (the commercial capital of Bandundu Province) was attacked briefly, and once again these forces withdrew before Kinshasa was able to respond effectively. In 2009 to 2010, in Equateur Province, rebels were able to invade Dongo and more significantly capture the province capital, Mbandaka, despite the presence of MONUC and FARDC units. Predictably, these rebels withdrew before Kinshasa was able to respond. In 2011, Lubumbashi airport was attacked. Again the perpetrators withdrew before an effective response could be marshaled. Also in 2011, Kinshasa itself was attacked, and the group in question was able to penetrate Camp Kokolo in the heart of the city and then proceed to one of the President’s residences. There is some dispute about the fate of the attackers. Regime circles claim that over 200 were captured, but persons close to the attackers claim that they all escaped, and that the regime imprisoned 200 men with ethnic roots in Equateur Province. Finally, there have been repeated clashes in the Bas Congo region between a religio-political movement, the Bundu Dia Kongo (BDK), and the Kabila regime’s police and military. Unlike the examples cited above, these have been provisionally suppressed popular uprisings without any apparent military know-how or leadership. What do these incidents have in common? With the exception of the BDK, they can all claim extraordinary initial success and an orderly withdrawal. One must ask whether these are isolated, insignificant events, or instead probes by organizations with more significant resources. If the latter, are these groups waiting for the right moment to launch a substantial attack against the regime? Given the great crisis of legitimacy that is currently affecting post-election Congo, the temptation to employ force against the regime must be considered substantial. Is the inhibition to employing revolutionary violence against foreign support a thing of the past? In that regard, one thing is clear: the West is almost certainly unwilling to back the existing regime with military force. However, history shows that the West may have been replaced in this role by the regime’s African supporters. Dissatisfaction and red-hot anger are now widespread in the Congo. Will the Congolese people follow in the footsteps of the Arab spring and make the ultimate sacrifice for political change? Or will the option of non-violent protest ordered thus far by Etienne Tshisekedi prevail? If the latter should happen, how will it fare given the authoritarian predilections and successful repression currently employed by President Kabila?